Gunmen attacked a group of parents waiting for their children outside an elementary school Wednesday, killing one man and wounding five other people in a dangerous part of the Mexican border city of Ciudad Juarez. The Chihuahua state prosecutor's office said two cars drove up to the school around noon, and two men got out and started shooting, apparently with assault rifles. The gunfire wounded one man and four women, prosecutors' spokesman Arturo Sandoval said. Teachers locked down the school, not allowing students to leave until the situation calmed down. Frightened parents rushed to the school to search for their children. 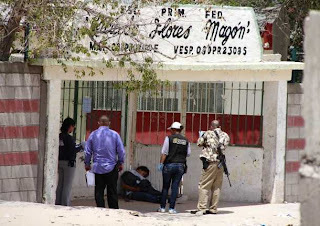 No information on the motive for the attack was released, but schools in Ciudad Juarez have reported receiving threats and extortion demands in the past. The federal Interior Ministry condemned the shootings. "This is precisely the irrational violence that should be combatted equally by all three levels of government," its statement said. Mexico's federal government has been urging state and local authorities to improve their police forces with better training for their officers and by investigating officers for possible ties to crime organizations. The Sinaloa and Juarez drug cartels have been fighting for control of Ciudad Juarez, which neighbors El Paso, Texas. More than 6,000 people have been killed in the city since 2008.